Unconditional offers: a self-defeating policy? In the UCAS admissions round for 2013 University entry, The University of Birmingham triggered a seismic change in recruitment policy when they introduce unconditional offers to strong candidates on the basis that the applicant made Birmingham their firm, rather than insurance, choice. Many competitor institutions thought Birmingham ought to be reprimanded for breach of admissions etiquette. Far from this being the case, Birmingham was actually named University of the Year 2013-14 in The Times and The Sunday Times Good University Guide. Judges praised their “bold – and successful – approach to recruitment”. What were other universities to do? In the 2013-14 recruitment round a number of further institutions decided to also make unconditional offers, with or without strings attached. It is predicted that in the coming year even more institutions will adopt the practice. This development worries me, a lot, and here’s why. What has the Red Queen got to say to admissions tutors? Firstly, there is a evolutionary theory known as the Red Queen hypothesis. 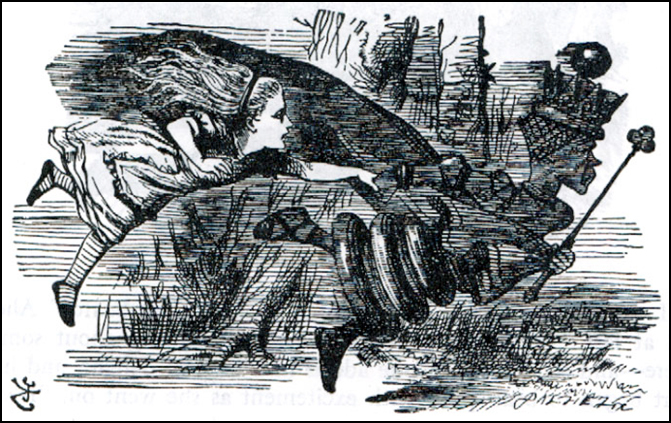 In Lewis Carroll’s Through the Looking Glass, the Red Queen informs Alice that “it takes all the running you can do, to keep in the same place”. This could easily be applied to the recruitment trend. If it reaches a point where the majority of universities are making unconditional offers then there will no longer be any selective advantage over competitor institutions – the benefits of making unconditional offers will have been lost, but the detrimental aspects (e.g. accepting students who have failed to fulfil their academic potential) will remain. Secondly, I am concerned about the impact this development will have on the integrity of grade predictions offered by schools. Back in the 1990s, in a previous incarnation, I taught A Level Chemistry. One year, after I had made the grade predictions for my group, I was contacted by the parents of one student. “You’ve predicted a C for [let’s call him Johnny]. He won’t get offers for his chosen course at university if that’s his prediction, so please can you change this to an A”. I declined their appeal on the grounds that it was just delaying the inevitable; Johnny wasn’t going to get an A so better to face up to the disappointment now and select a more appropriate course. Now, fast forward to a world with unconditional offers. Provided that Johnny has a sufficient crop of A* grades for his GCSE, those predicted grades start to have real currency. If Mr Willmott the Chemistry teacher can be cajoled into upping Johnny’s prediction from a C to an A then there is a real chance he can blag an unconditional offer and treat the C he ultimately gets as though it was just a bad day at the office. If we continue down the “unconditional” route, teachers are going to be put under immense pressure to inflate their predictions because the natural safeguard we’ve had against this previously (i.e. when results day reveals Johnny does not have adequate grades to fulfill the conditions of his offer) will no longer be there. Unscrupulous schools have everything to gain by over-inflating their predictions; the league tables will show that they got more students into top Unis. The Universities themselves, however, will have an increasing number of first year undergraduates who do not necessarily have the academic foundations necessary for the courses to which they have been admitted. It is even possible that the students themselves may suffer if the course turns out to be too much for them.